Photos taken on yesterday’s Hidden Harbor Tour organized by the Working Harbor Committee. Many more photos to come! 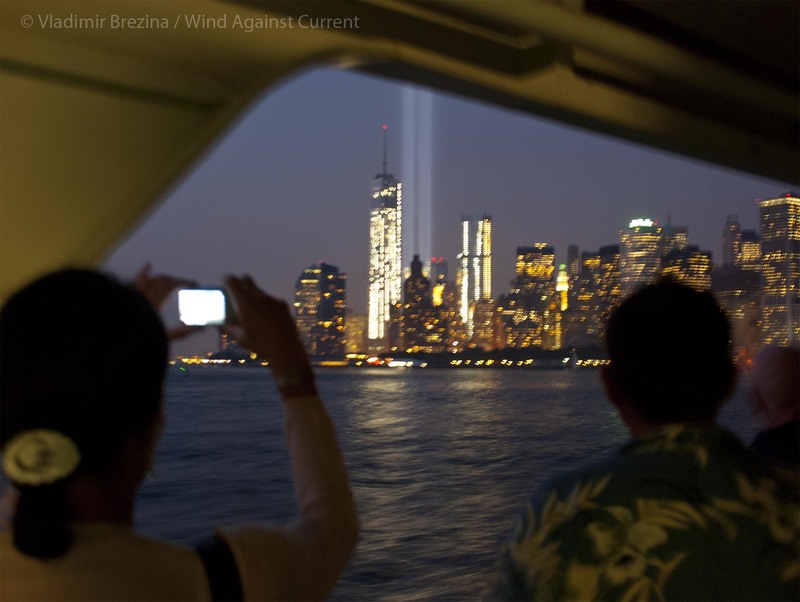 This entry was posted in New York City and tagged 9/11, New York City, Photography, Tribute in Light, World Trade Center. Bookmark the permalink. Thanks for sharing – amazing!! Play the cards you are dealt — and you did it well, Vlad. So touched by these pictures. Thanks for sharing. You are very welcome—thank you!! Thanks for sharing will all of us who don’t live by NYC. Glad to be able to do it… Thanks!! I remember that day like it happened yesterday. Such a beautiful september day turned just like that into a horrible scenario. 9/11 will always be marked with red in humanity’s calendar. Thanks for sharing your beautiful photos and tribute! We spent a week in 2000 staying at the World Trade Center hotel for a conference, and spent a magical day / evening at the top of the world trade tower. The memory of my then 4 year old holding his face and body against the glass window as the sun set will live with me forever. I have a christmas decoration that I bought from the gift shop up the top that each year comes out and I shed a tear and say a prayer. We were back in Australia by 9/11 but my husband, son and I were deeply affected by the events of that horrific day. My son cried in bed for many months afterwards. 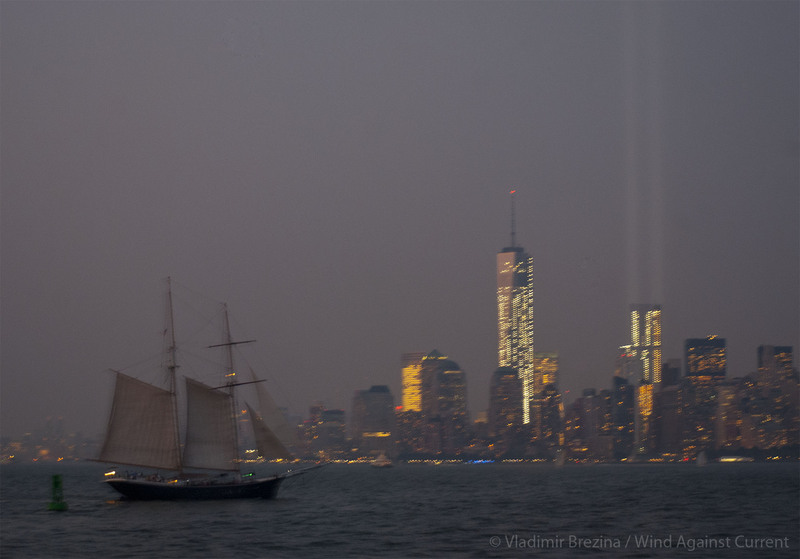 I haven’t been back to NYC since, so it is lovely to see your tribute photos and the light towers. Thank you. I was at the top of one of the towers too a week or two before 9/11. Thousands of people all round the world have such memories… Thank you so much for yours!! Merci beaucoup pour la splendeur de ces photos, encore plus émouvantes quand on pense à la tragédie de 2001, il y a 12 ans déjà, mais toujours si profondément inscrite dans la mémoire et le coeur. Et les 2 colonnes de lumière sont bien le signe de cette blessure ineffaçable dans l’histoire des hommes. And thank you for your lovely comment, which we appreciate very much! very interesting…thank you for sharing! These are wonderful, touching photos. 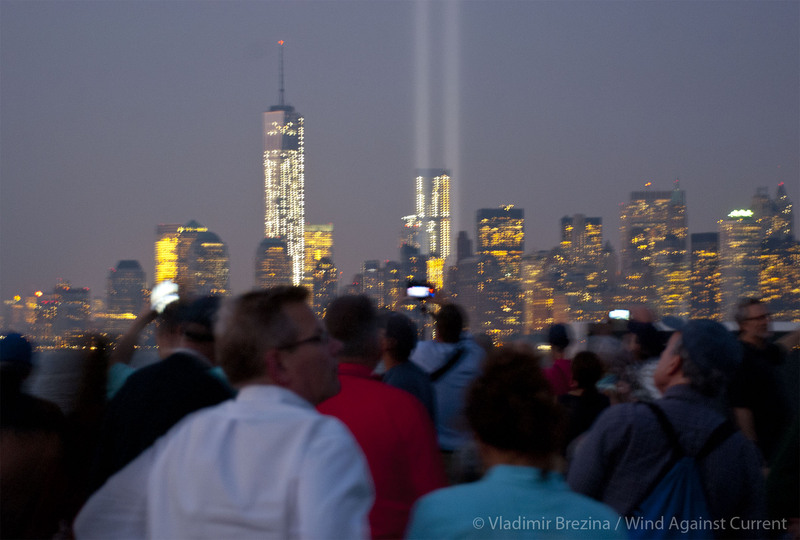 I remember seeing the beams of light in place of the buildings when they first went up. 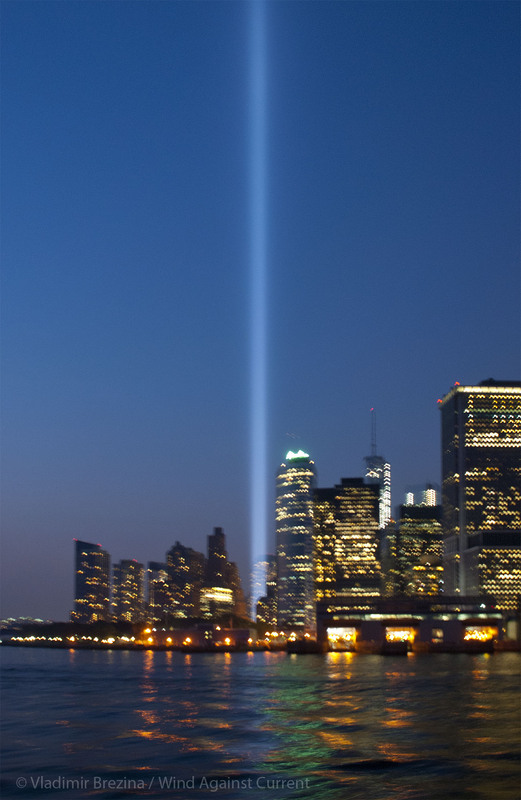 I hoped they would just shine forever as a memorial, a comfort to those who lost their beloved family members – and to the rest of us to help us as a global community to learn to live in peace. love, respect and tolerance. Light means there cannot be darkness. Thank you for sharing for those of us who could not be there. Unforgettable memories. Wonderful photographs, thanks for sharing. You are most welcome, Indira—thanks for stopping by!